History remembers the night of 24 December 1898 as marking the start of Louis Renault's automotive adventure. That was the evening it all started. On Christmas Eve, Louis Renault went out with friends at the wheel of a small car (the Voiturette) he had built himself. He had converted a Dion-Bouton tricycle into a quadricycle which he had fitted with a three-speed gearbox plus reverse, with the third gear in direct drive. Renault Voiturette: Tilbury type bodywork, single-cylinder air-cooled engine 1 hp 3/4 built by Dion-Bouton. Produced between 1898 and 1903. This system cut down energy losses and increased the vehicle's power output using the same engine. To prove this, Renault drove up the long, steep Rue Lepic leading to the top of the hill of Montmartre. This achievement was hailed by witnesses and Renault received his first orders that very day. 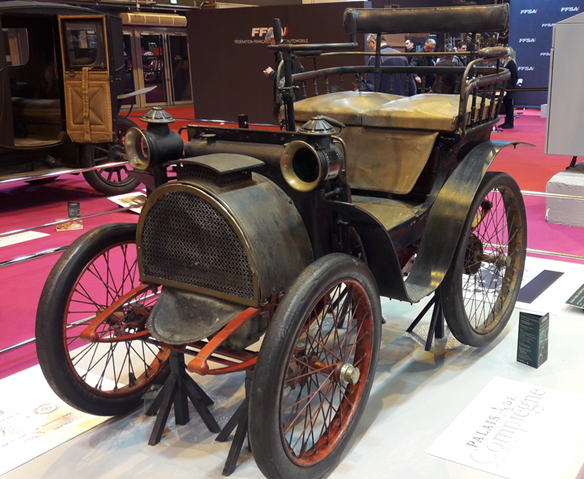 He filed for a patent at the beginning of the following year and started his industrial adventure with the support of his brothers, Marcel and Fernand, creating the Société Renault Frères (Renault Brothers company) two months later.